The Victorian Government is committed to managing the koala population and over-browsing of Manna Gums on a number of private properties at Cape Otway. Over-abundance of koalas at Cape Otway is a difficult, long-term issue brought about by their love of Manna Gums, their reluctance to change food source, favourable climatic conditions and an absence of predators. Unsustainable koala densities and subsequent over-browsing of the habitat at Cape Otway had resulted in many of the koalas’ preferred food trees dying. Without a sufficient food source to sustain them, the health of the koala population can quickly decline, resulting in koala welfare issues. In early 2015, DELWP established an independent expert panel of animal welfare and ecological experts on how to proactively manage the koala over-abundance at Cape Otway. This resulted in the development of the Cape Otway Koala Management Actions. Since 2015, DELWP has been delivering management programs identified in the Management Actions to improve the health of the koala population and their habitat at Cape Otway. Key management actions include health assessments, translocation, euthanasing any unhealthy koalas to prevent their suffering and fertility controlling healthy females. The first recommended action by the expert panel was to conduct a four-day koala health assessment in May 2015. Results indicated a link between poor canopy cover and poor koala health. This two-week operation to improve the welfare of koalas at Cape Otway involved capturing and assessing a total of 395 koalas. A total of 341 healthy koalas were released back into the wild, 166 females were treated with fertility control hormone implants, and 37 koalas were radio-collared and translocated to an area in the Great Otway National Park as part of a trial. Unfortunately, 54 koalas were humanely euthanased due to health issues. During the operation, 69 dependent back young were captured and released with their mothers. Four back young were rehomed to a Victorian wildlife park after their mothers were euthanased due to poor health. Initial monitoring of the translocated koalas showed positive results after 137 days with minimal adverse health impacts on most of the koalas. The last comprehensive monitoring of the trial translocated koalas has been finalised and the Arthur Rylah Institute (ARI) is currently developing its report. The translocated koalas adapted well to life in their new forest home. These monitoring results complement processes to inform the decision-making regarding management programs at Cape Otway. Our scientists with expertise in wildlife ecology and habitat modelling used habitat mapping to identify a suitable translocation site north of Lorne. As part of the habitat mapping process areas close to main roads were excluded. Site visits were undertaken to estimate resident koala densities and verify the presence of koala food trees prior to finalisation of the translocation site. 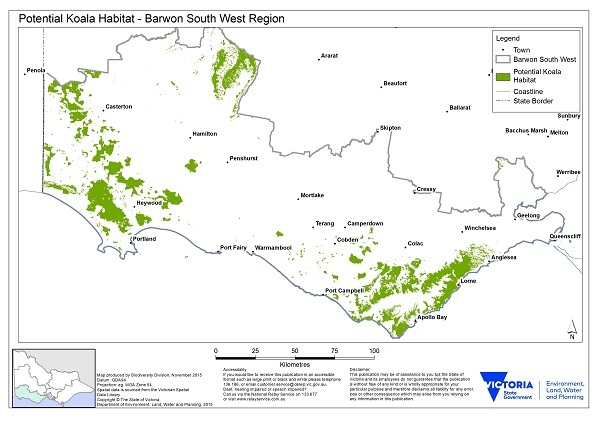 This map highlights areas of modelled koala eucalyptus habitat. Translocation of koalas from Cape Otway to the Great Otway National Park was undertaken to help manage the immediate welfare needs of the Cape Otway koalas and reduce over-browsing of their preferred habitat. Translocating koalas at this time of year enabled them to adapt to their new environment well before any cold, wet weather. Over four weeks, a total of 528 adult koalas and 119 dependent back young were captured and health checked by qualified vets. Some 213 females were fertility controlled, with 69 adult koalas and one dependent back young euthanased due to health related issues and to prevent further suffering. Twelve dependent back young were re-homed at approved wildlife parks and 85 koalas not suitable for translocation were released back at their site of capture at Cape Otway. Most koalas in the trial and in the control group at Cape Otway, were recaptured and assessed through the second comprehensive monitoring conducted by ARI in February 2016. The results were encouraging with the translocated animals doing better than those returned to their original home ranges at Cape Otway. A two-week fertility control and health check program focused on catching female koalas not previously caught on private properties with high koala densities. A total of 259 koalas were captured and assessed at the vet station. Of those, 246 were female and 13 male, with 184 healthy females fertility controlled. Unfortunately vets considered 10 koalas to be in poor health and these were humanely euthanased to prevent further suffering. A total of 249 healthy koalas were released back to their site of capture at Cape Otway. No dependent back-young were encountered. Results indicated an overall improvement in the health of the koala population with such a low percentage (4%) of koalas euthanased, significantly down from previous programs. The Spring program to conduct fertility control, health check and translocation of koalas aimed to reduce koala population at areas of high densities and declining canopy cover to assist the Manna Gum woodland to continue to recover. A total of 343 koalas were captured and assessed. Of those checked, 95 healthy females were fertility controlled and 236 mature koalas and 54 back young were translocated to suitable habitat in the Great Otway National Park. All captured animals were in good condition. However, 28 koalas were determined by veterinarians to have significant health issues and genetic abnormalities. These animals were humanely euthanased to prevent further suffering. There were no orphaned back young during the delivery of the program. All efforts were made to ensure female koalas were not translocated if they were pregnant, or carrying female pouch or back young under two kilograms. All translocated females and female back young over two kilograms were fertility controlled prior to translocation. The Autumn 2017 program aimed to help the Manna Gum woodland continue to recover by reducing koala populations in areas with declining habitat. A total of 280 koalas were captured and assessed. Of those checked, 94 females were fertility controlled, with a total of 195 mature koalas translocated to suitable habitat in the Great Otway National Park. Although all captured animals had good body condition, eighteen koalas were assessed to have significant health issues and genetic abnormalities by the veterinarian. These animals were humanely euthanased to prevent further suffering. Fortnightly surveillance monitoring of the translocated koalas was carried out in June. All koalas found were in good health and no issues were detected. Provision was made for one orphaned back young to be hand-raised by an authorised wildlife shelter until independent. It will then be returned within its original home range. In line with the Cape Otway Management Actions (2015) and as part of ongoing fertility control measures, DELWP will be delivering another fertility control, health check and translocation program in Autumn 2018. The program will commence on 7 May 2017 for a two-week period. The Autumn 2018 program aims to help the Manna Gum woodland continue to recover by reducing koala populations in high koala density areas. Areas with the highest koala densities and declining habitat will be targeted for translocation and fertility control of females that have not been previously caught. This will help reduce the breeding rates in the future by maximising the percentage of fertility controlled female koalas within the population and minimising the percentage of the population that can breed. Whilst there is an emphasis on catching female koalas that have not previously been caught, males that are relatively ‘easy’ to catch and have not previously been caught will be targeted as well. Where possible any koalas that visually look in poor condition will also be caught and a health check performed. Similar to previous programs all captured koalas will have a health assessment and those females that weigh over two kilograms will be fertility controlled. Koalas assessed by the veterinarians as having a condition score <3 (i.e. poor health) or have significant health issues including genetic abnormalities will be humanely euthanased. If an orphaned back young koala is encountered during delivery of the program, the koala will be hand-raised by an authorised wildlife shelter until independent and then returned within its original home range. Any female koalas over 2 kilograms will be fertility controlled prior to being released back into the wild. DELWP would like to extend our sincere thanks to the Cape Otway community especially local landowners, businesses, the Conservation Ecology Centre and other research partners, for their cooperation during the fertility control, health check and translocation programs at Cape Otway. What is the current situation at Cape Otway? As a result of DELWP’s koala management programs, there has been a steady decline in the mean koala density across private properties from 13.9 per hectare in October 2015, 6.8 in February 2016, 6.9 in October 2016, 4.7 in December 2016, 4.2 koalas per hectare in March 2017, to 2.8 per hectare following the 2017 May program. Latest monitoring of nine transects in March 2018 indicates an average density of 1.8 koalas per hectare, however, high koala densities remain on some properties. It is estimated that there are now approximately 220 koalas remaining in 120 hectares of Manna Gum and some mixed Eucalypt Woodland. The lowest density is 0.7 koalas per hectare and highest density is 4.0 koalas per hectare. Current koala density is very encouraging and there is an opportunity to further reduce koala densities at Cape Otway. This will help continue to manage the koala population at Cape Otway in a proactive way. As part of the draft Barwon South West (BSW) Koala Management Plan, lower koala densities will allow long- term management of the koala population through an ongoing fertility control program based on monitoring results. This is aimed at ensuring healthy habitat and a population of healthy koalas at Cape Otway. The koala management program at Cape Otway is informed by the results of the previous programs, and where relevant, targeted monitoring and research. For example, ARI’s report on the carrying capacity and habitat health assessment of Manna Gum dominated areas of the region will assist the BSW region to plan its koala management actions at Cape Otway and other forest areas in south west Victoria into the future. DELWP will continue to manage the koala population through ongoing fertility control, health checks and translocation programs when required.